Just because you have a small kitchen, it doesn’t mean you have to compromise on its style and functionality. By smartly planning for each of your compact kitchen’s components, starting from layout, storage to appliances, you can easily maximize the space. In today’s post, we’ll give you five useful ideas to overcome space limitations in your kitchen. A single-bowl, undermount sink can provide more counter space for preparing food or keeping utensils. Since the edges of the sink remain concealed, you’ll get more workspace beside the sink. It also comes with a flat draining area which you can use as a second surface. Available in several styles, you can choose one that suits your kitchen to achieve a streamlined look. A compact all-in-one kitchen island with storage for spices, knives, pots, and pans, and a workstation is an ideal choice for small kitchens. Place the island in the centre of your kitchen to make the most of the limited space or according to your convenience. When choosing an all-in-one island, make sure that it has some space to position some stools around so that it can also serve as a breakfast corner. You may wonder how this can be a space-saving idea. But, when you think of the possibility of walking into the bulky handles and knobs of your kitchen cabinets, it may not seem a minor issue in a small, narrow kitchen. Replace your old bulky hardware with slender, minimalist pulls, bars or go for cabinets with inset troughs. Opt for some vertical pulls for cabinet doors or your wall cabinets as they help emphasize the kitchen’s height. In a limited space, you must plan your storage carefully. Don’t use every kitchen wall for storage as that can make the room look even smaller and congested. Instead, install floor to ceiling kitchen cabinets along just two walls. They’ll provide adequate storage as well a unique personality to your kitchen by visually expanding the space. If you like wooden cabinetry, choose vertical wood grain as it’ll make the simple lines of the cabinetry look more emphasized. Besides cabinets, you can also install a few rows of racks and S-hooks on a blank wall to hang pots, pans, and other kitchen tools. Big isn’t better in a small kitchen when it comes to appliances. Find smart appliance styles specifically designed for small spaces so that you don’t have to give up on important storage to fit them in. Remove the kitchen door if you want to make the room appear more spacious. If there’s not enough space for a pantry, then consider a pull out pantry at one of the narrowest spaces in the kitchen. Replace floor cabinets with drawers to enhance usability and space. Drawers will also help to make the area look sleek and organized. Follow these ideas when you want to utilize every inch of the limited space in your small kitchen. 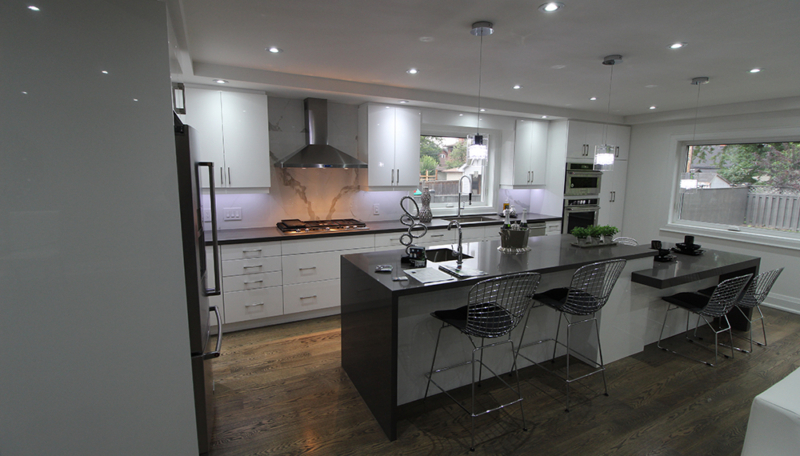 Contact Euroline Kitchens for custom cabinetry and kitchen renovation services in Mississauga and the GTA.